I'm half Spaniard half Argentinean. I move to UK when I got hire by BBC in 2014, I'm still working there! "Passion for fashion" (oh what a clichè) but I really find fashion deeply motivating. Also design, photography are very important as well as my profession as an audiovisual producer. iOcklo came to life from my deep interest on design, fashion and personal style. So I created this space to express my ideas and discoveries about fashion, culture and life choices, under the tagline "be cool, be great, be yourself". With a profession in film production, my background is not from the world of fashion nor from the world of design. I simply LOVE﻿﻿ everything about designers, trends and street style. 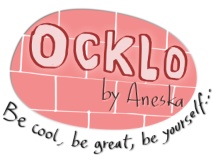 My website ocklo.com is written in English and sometimes in Spanish (This bit is part of StyleLovely.com & Hola! Fashion) a platform widely known in Spain. On this space I will tell you things about myself and my lifestyle, from time to time. I dedicate my time to film production, and some years ago, for a short but intense period of time, created and sold design clothes under my own label, "Mal Genio". Fashion design in Spain & UK, from where this web is made, both countries have awesome exponents, incredible and really talented designers. Many of them you already know, but there's plenty more waiting to be discovered! This site as a place for everyone to showcase their work, the already famous as well as those who own the perfect little store full of "objects of desire." Fashion is an art and designers, like any other artist, must have talent, but also must put a great deal of effort and obsession to bring the results of their work into our daily lives. The main goal is to talk about season designs, designers, experiences, tendecies and revolutionary proposals that can bring an extra value to fashion products as objects of art and as consumer goods. Watch the sunrise, take a deep breath, enjoy the shapes, colors, flavors and sounds of your daily life.